Wondering what to do next week with your pumpkins after Halloween is over? Save some for your face! This pumpkin face mask is especially useful for those with sensitive and irritated skin. It's high in Vitamin A, C and Zinc, which are all beneficial in treating acne. 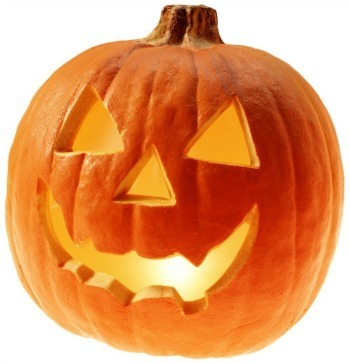 The pumpkin soothes, moisturizes and can also help skin to absorb other useful ingredients. Just remember - even though I provide you with different types of masks to try on your skin (to see what works best for you), topical skin "helpers" can only do so much if they're not accompanied by a real acne treatment that works from the inside. For Dry Skin, exchange milk for one-quarter teaspoon heavy whipping cream or, for extremely dry and sensitive skin, extra virgin olive oil. For Oily Skin, exchange milk for one-quarter teaspoon of cranberry juice. Combine the ingredients for your face mask. Mix gently, and apply to your face avoiding the eye area. Rest and relax for 10-15 minutes while your pumpkin face mask gently moisturizes, nourishes and conditions your skin. Rinse with warm water; pat dry (do not rub!). Then, apply a non-comedogenic moisturizer. PS: Pumpkin is also an excellent beauty food with a great amount of antioxidants and fiber, so this would be a good time to make one of your favorite healthy recipes - pumpkin really is one of the most versatile foods! And don't forget to come on over to Facebook to let me know how this mask works for you!